This version provides an additional reduction in memory use and adapts to IOS8 coding practices while providing a number of other subtle improvements. What could be more ancient and pure than the Circle. This beautiful Puzzle Game places circles within circles to be spun by fingertip. Prestigious universities have yet to solve the most difficult 16th level. These sixteen levels range in difficulty from childishly simple to so complex as to have left even Ramanujan feeling tortured and inferior. Select your level of difficulty and hit the scramble button. There are 4 colored wheels, each composed of three pieces. When scrambled, these pieces become entangled. Difficulty arises when gears bind the wheels together in various ways, requiring complex strategies to spin the colored pieces back into place. Twelve indicator lights may glow, indicating which game pieces are in their correct home position. Solution strategies require thought processes similar to that of hand held cubic puzzles. Are you going to be World Champion. Let Game Center reveal your greatness to the World. As a tool for Educators, I.Q. of Nanu might be used to demonstrate entropy by considering why some levels are more difficult to solve then others and why highly ordered states are unlikely to be produced by random circumstance. The more difficult levels can be characterized as low entropy configurations. Kirby's Level 2 is the highest entropy configuration and easiest to solve. 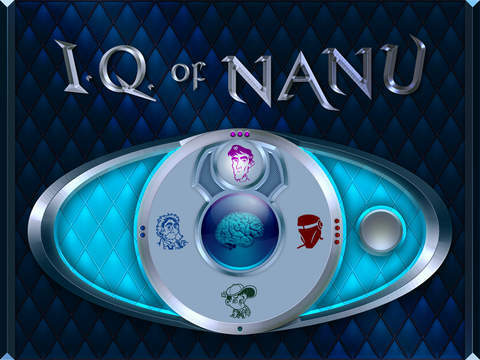 As of this release, Nanu's Level 4 has yet to be solved by either Homo Sapien or Extraterrestrial. As Champion, your Game Center avatar is visible by all players throughout the World as they begrudgingly struggle to surpass your greatness. Play well and be remembered, but be careful about playing too well. Because although the rumors that various government security agencies will be monitoring I.Q. of Nanu leaderboards for the purpose of identifying talent are probably not true, it is still possible that you may be revealing yourself as an interesting candidate for further study.